This page is for Windows Vista and 7 version. For XP version, see Solitaire (XP). For Windows App version for 8.1 and later, see Microsoft Solitaire Collection. Also known as Microsoft Solitaire, not to be confused with Microsoft Solitaire Collection. Game name, paths and executable names may vary for different localizations of Windows. Simply replace Solitaire with localized counterpart. Requires a workaround on Windows 8 and later (see Run on Windows 8 and later). Bundled with Windows Vista and Windows 7. For fullscreen mode launch with -mce parameter. Only supports XInput controllers and Windows Media Center remotes. Language depents on OS language. Solitaire and other bundled games are unavailable after upgrading to Windows 8. The steps below make the Windows 7 version run on Windows 8 (there is no fix for the Vista version yet). If you did a clean install: go to sources on the Windows 7 DVD and open install.wim using 7-Zip. Copy the recovered Solitaire folder somewhere convenient. For upgrade install look from C:\windows.old\Windows\System32\ and for clean open install.wim by same method as in last step. Open Solitaire.exe with a hex editor such as HxD. Move cardgames.dll inside the solitaire folder next to Solitaire.exe. 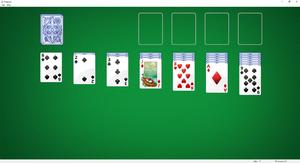 Solitaire will now run on Windows 8 and later. This page was last edited on 8 April 2019, at 11:26.